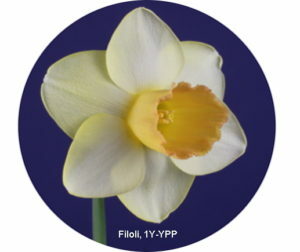 After a while, one daffodil bulb becomes two, then suddenly it has multiplied until there are now ten bulbs. For the small grower where there is not too much space for planting in a bed, but if there is some ground at the edge of a woods or an orchard, bulbs can be planted in drifts which will add beauty to the landscape. The area chosen for naturalizing bulbs should have good drainage and receive some sun during the day. At the edge of a woods, early blooming cultivars can be planted as they will receive enough sun to ripen the foliage before the trees mature their foliage. Choose an area where the grass can be left unmowed until foliage has matured. Hillsides are excellent spots to place drifts of bulbs. Bulbs should be planted in drifts of like kinds and like colors. A drift of one cultivar of bright yellow is eye-catching. A drift of fifty or so bulbs will turn the heads of those who are not daffodil lovers. After an area has been chosen for naturalizing, decide what color, how many will the space accommodate, what cultivar will do well in that spot. Some cultivars do not do well in naturalized settings. Many of the older, tired and tested cultivars will live for at least thirty years in the sod and some as many as fifty and still bring forth some blooms. If planted properly, bulbs in the sod can live and bloom for many years with a minimum of care. When planting bulbs in a natural area to be left undisturbed for years, plant deeply for your type of soil. When planting in clay soil, the bulb ought to be planted at least eight inches deep. There are several methods of putting the bulbs into sod or soil which is not cultivated. One method is to use a broad spade, cut two lengths of the spade and a cut at each end, then throw back the sod or soil; if cut is not deep enough take out some soil, then work up soil in bottom, add a mixture of sand and peat moss, add about a tablespoon of low nitrogen fertilizer, mix well, then place a handful of sand where bulbs are to be placed, set bulbs in place and cover bulbs with soil and replace sod or top soil. Usually about five bulbs can be placed in each area. The fertilizer under the bulbs will keep bulbs growing for years. Another way of planting in the sod needs a strong-armed person who can sink a crowbar six to eight inches into the ground. Then work the hole by rotating the bar, then drop in sand, peat and fertilizer mix, add a handful of sand and then the bulb. Fill hole with sand. A third method is quite new and a good one for the gardener with money to invest. There is a new drill method. For those with an outdoor electricity source, a half-inch drill with a three-inch bit works well. As many as a half bushel of bulbs can be planted in a short time. For those out in the field or away from a power outlet, the battery-powered drill with rechargeable batteries can be used. One can use this drill about four hours between charges. Some varieties which make beautiful drifts and last well are Ice Follies, Tete-a-Tete, Flower Record, Delibes, Unsurpassable, Barrett Browning, Scarlet Gem, Geranium, Cheerfulness, Peeping Tom, Mount Hood, Spellbinder, Carlton, and Viking. There are many others which will thrive with little care. In climates with hot summers and mild winters, tazettas are the best choice for naturalizing. Some good cultivars are Avalanche, Grand Monarch, Erlicheer, Soleil d’Or, Autumn Colors, and Golden Dawn.